Born For Geekdom: Hooray for Hokum! which I am also reading. Hi. 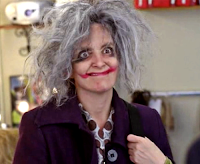 My name is Audrey and I'm a recovering blocked creative. Again. I cringe at the words. Let me explain. A handful of years ago, back when Myspace was a thing (Remember that?) and I was super into it, I used to follow actress Jenna Fischer's Myspace blog. She wrote a fabulous answer to the question so many young and aspiring creatives ask her, "How do I make it?" (I found it, here it is.) 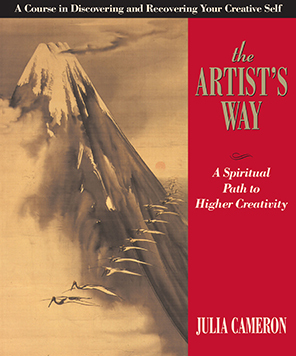 Fischer recommended "The Artist's Way". So I bought it. The complete collection. And at the time, when I read the book and did the work that it requires, it opened up a whole new world for me. It was at that time that I started wearing flowers in my hair (Silly, but kind of a permanent Audrey thing now. ), tried playing tennis (Still my favorite way to burn calories and release aggression.) and finally and fully admitted to myself (after years of sporadic publishing) that I wanted to be a writer and therefore enrolled in a graduate program for creative writing. I embraced my inner fangirl. I went for it in every way. The results changed my life. During that phase, I would sit on my bed in the Muncie, Indiana apartment I shared with my husband and cats and watch episodes of Samantha Brown at Disney world on iTunes on my laptop. I went from being kind of listless to moving forward in my life. And all of that momentum, the graduate degree, the book I was forced to write, the theme park web series I started (Park Geeks and/or Theme Parks with Audrey and Jake) and the general shift in my demeanor brought me to where I am now. I am a working creative professional living in Orlando, Florida. Last year, my husband and I sold our first two screenplays. I just finished thirteen months of writing/shooting/directing/editing a local theme park TV show that allowed me behind-the-scenes at every major theme park in Orlando. I was fortunate to work with some of Orlando's most brilliant comedic minds. I grew and changed so much during the fevered pace of working on the show with Jake that I now know what I'm capable of churning out, even under enormous time, budget and stress constraints. In a strange way, literally all of my dreams have come true over the last year. And wouldn't you know it? Turns out, it's not enough. You see, the dreams that have come true over the last year were the dreams of twenty-four-year-old Audrey. All she thought about was feeling fulfilled, working and having fun! She forgot to ask about money, family and a stable future for herself. Whoops. On August 30th, I'll turn thirty. And six years makes a difference. And I'm realizing that I need more. No, not more, but something different for sure. As you get older and you begin to lose people you love or even miss out on the lives of those you love because you are working too hard, priorities shift and I realize that I have been living in metaphorical clothes that are too small for me. It's not that I think I'm too good for twenty-four-year-old Audrey's dreams. I'd be lucky to live out the life she planned for "us"! But she had her day and accomplished her goals. This is such a silly blog. But you get what I'm trying to say, right? I need to move on somehow. There are new horizons to chase, new goals to go after. And about-to-be-thirty Audrey is thinking more practical. I know. 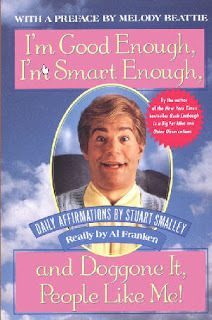 I'm so Stuart Smalley right now. And just FYI, this blog post is FULL of bragging. And I know it. I would punch me in the face for making such grandiose statements. But part of the Artist's Way...oh wait, I should tell you about that too. So I'm doing The Artist's Way all over again. From the beginning. And I'm finding that this round through, my answers are very different. Very revealing. And very helpful. 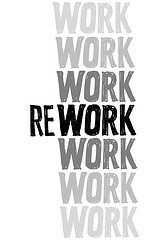 I'm also reading the incredible "REWORK" and doing the "Leading from Your Strengths" book and assessment. And aside from this blog and some fun spontaneous stuff, I'm not moving forward on anything again until (at the earliest) the second week of September. I desperately needed a rest from thinking about the big stuff. I believe in personal responsibility. I own where I am now. I own the good things and I also own the bad things. I own my positive career progress. I also own the fact that I am not where I want to be financially. I know, this sounds like COMPLETE HOKUM! Positive affirmations, self-centered exploring, thinking on personal motivations...ick, ick, ick. I cringe. I shudder. It's awful. It goes against every fiber of my being. I think to myself often, "I'm not the kind of person who does this stupid stuff!" over some of the past few months. But it turns out, I am the kind of person who does this stupid stuff. I have to be. And I remember feeling that way the last time I went through the book too. It's called resistance. By staying blocked creatively, by being able to blame others for where I am now, I never really have to do the work that I'm afraid to do next. (Plays, more short films, maybe starting some kind of a business in order to become independent and financially stable.) And therefore I never have to take the risks required in doing those things. I don't have to fall flat on my face, as I surely will when I go out on a limb to try to get to the next phase of life. As one does when we have to learn by doing. There are gains to everything. But I don't want to stay in the place of always blaming others for not having what I need or want. Julia Cameron, author of The Artist's Way questions why we can beat ourselves up, say every negative thing about ourselves, but not be just as conscious about the positive things. Why can we talk about how awful we think we are, but not admit to what we want or might be good at? 1. "Ew! This is stupid, I won't do it." 2. "I'm desperate for some kind of a breakthrough, I'll do it, but I won't like it!" 3. "I'm doing this, I feel so stupid." 4. "Hey, this is working!" 5. "Yay, I'm free, *general obsessiveness with the self-help process*." 6. "I feel better I don't need that anymore!" Wait three to five years, lather, rinse, repeat. Yes, I love movies and TV. Yes, I LOVE my jobs. Love, love, love. Yes, I am still fangirl, hear me roar. But I'm also craving a foundation. A building block from which to begin a family and a career that I can claim somehow and be responsible for. I guess what I want to be is an adult. A grown-up creative. I want to stop searching and start building. So here's to seeking new inspirations and standing at the edge of a void and not turning back even though you really, really, really, really want to. How "The Mindy Project" Won Me Over!